It's August. It's one of my favorite months of the year. Summer is in full swing, the sun is high, the days are long, and I'm blasting that Don Henley track an awful lot. 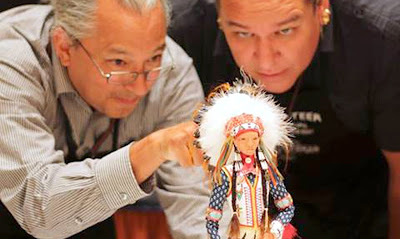 Another reason why I adore August is the fact that the largest gathering of Native American artists occurs during this magical month. The annual Santa Fe Indian Market, organized by the Southwestern Association for Indian Arts, brings thousands of artists together for one fabulous and inspiring weekend. 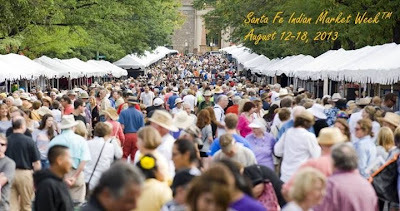 Over 1000 artist booths spring up throughout the town of Santa Fe and an equal amount either come to participate in the many events occurring alongside the white booth tents, or they come to catch up with friends and family, relax, and take in all the creativity. 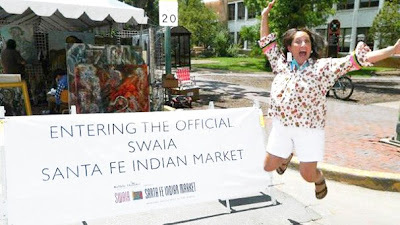 Over 150,000 people from throughout the US and abroad go to Santa Fe for Indian Market, and I am one of them. 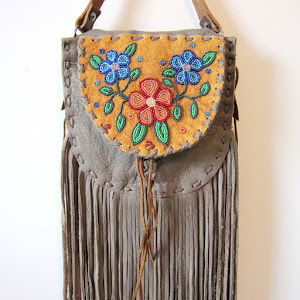 I insist on attending every year, and since I've been running Beyond Buckskin, I've put together a SFIM schedule of events - an exciting list of fashion and art events that you shouldn't miss. Scroll down to check them out. Details: I love high street art, and these guys bring it. From beautiful patterns, to graffiti inspired by ancient basketry, to political art that packs a punch, stop by and view the work of some of the greatest high street artists. Free and open to the public. 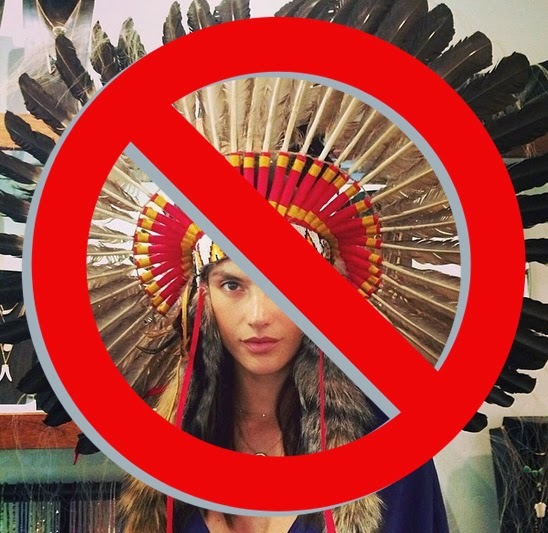 Details: One of the premiere art museums in the country, visiting the Museum of Contemporary Native Arts is a must. 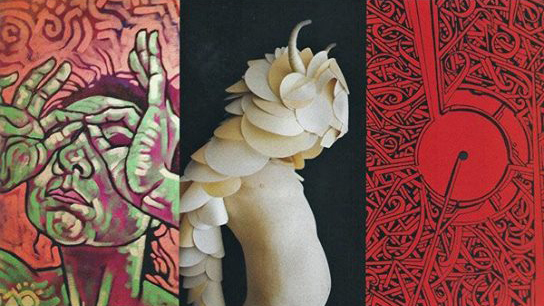 This season, they are celebrating a new exciting exhibit launch, "Changing Hands: Art Without Reservation 3 / Contemporary Native North American Art from the Northeast and Southeast" PLUS other great exhibits filling their halls. The reception will feature a special performance by Iroquois singer, composer and acoustic guitarist, Joanne Shenandoah. 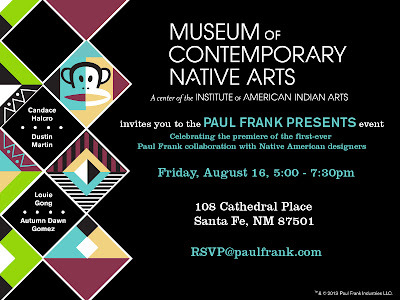 Details: Come celebrate the first annual Santa Fe Indian Market kick-off party featuring hip hop reggae beats by Cempoalli Twenty and Quese IMC and dance music by DJ Shock B. 21+. 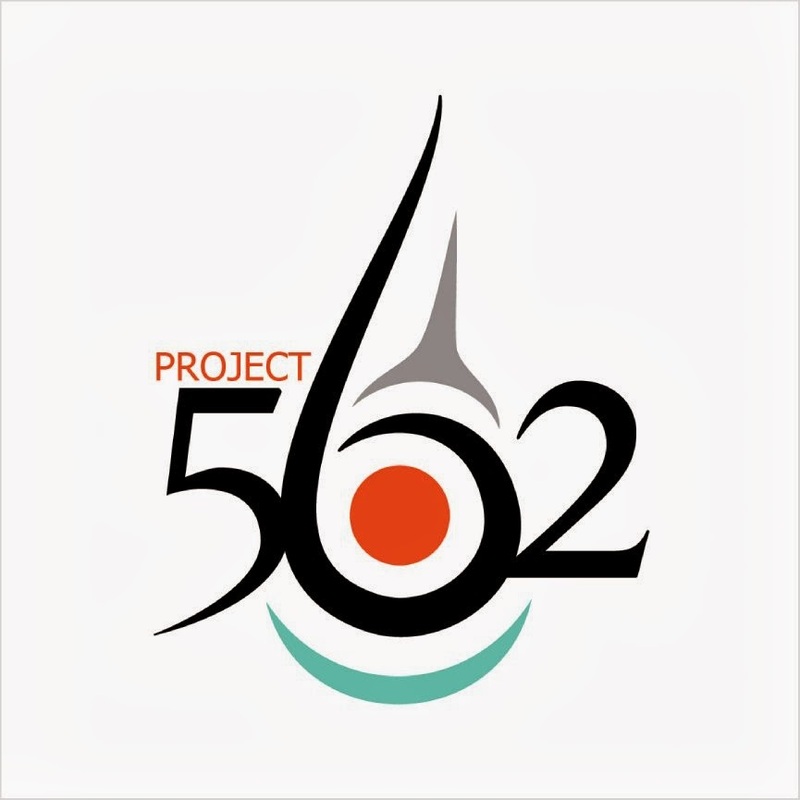 BONUS: Before you head to the launch party, run around and check out the other gallery openings at Blue Rain Gallery, Legends Santa Fe, Roxanne Swentzell Tower Gallery, and La Fonda Hotel Pottery Show. Details: "Positionality and Contemporary Indigenous Art" - This panel is part of a long term dialogue among indigenous and mainstream institutions, artists and curators. Free and open to the public. Limited seating. Details: Join the founders of style blog Presence 4.0 for an evening brimming with conversations on style, Native ingenuity and music. Dress to inspire. Attend to mingle. Free and open to the public. Details: Trunk Show Featuring Arizona Native Designers Earle Couture, Defy Mi, Dineh Couture, Marco Arviso, and HYPERCLASH of Santa Fe. Indian Market Weekend, Fashion show starts at 6pm. Free and open to the public. Details: Check out the winners! SWAIA's Artist Awards Sneak Preview gives SWAIA members the early opportunity to see the best of Indian Market art. The General Preview that follows opens the doors to the public for a glimpse at the award-winning artwork. For Tickets Call (505) 983-5220. Details: It's the moment we've all been waiting for: the official Market launches! Walk around the booth space, but be sure to check out these BBB artists: Waddie CrazyHorse at 258-PAL-N, Wayne and David Gaussoin at Booth #261 Pal-S, Courtney Leonard at the Plaza Booth Number 617, JT Willie at Booth 344 FR-S, Summer Peters at Booth 742 LIN W, Indigenous Princess at 900-CAT, and more. Free and open to the public. 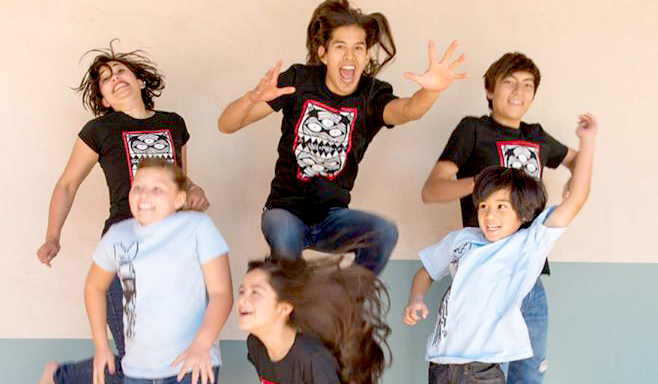 Details: This lighthearted and fun fashion performance will feature the t-shirt line that artist/designer Ehren Kee Natay created for Santa Fe Indian Market 2013. Models and dancers will also be showing off fabulous jewelry designed by participating SWAIA artists. Free and open to the public. 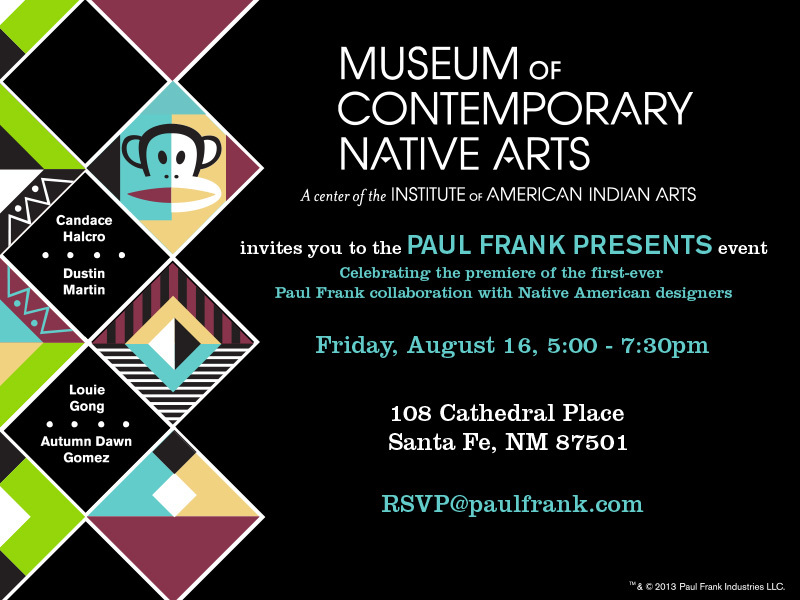 Details: Come celebrate the launch of a fun new Native art publication at the elegant Agave Lounge at El Dorado Hotel in downtown Santa Fe. Free and open to the public. Details: Spinning Live: DJ Element (Knucklehead Zoo/ Armory Massive/ PHX) and The Werewulf. Designs by: Pilar Agoyo, Consuelo Pascual, Sho Sho Esquiro and Walter Barney. Photos by: Thoshography. Ladies Free and Guys $5 til 1am - Everyone $10 after 1am. Fashion Show at 10pm. Come early. 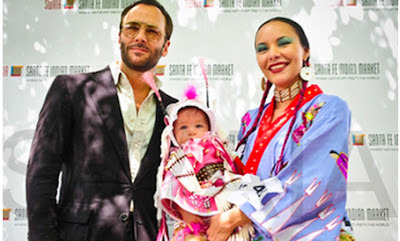 Details: Among the many cherished traditions at the Santa Fe Indian Market, the Native American Clothing Contest (NACC) is one of the most beloved and anticipated events of the weekend. For over twenty years, the NACC has been the most photographed event at the Santa Fe Indian Market. 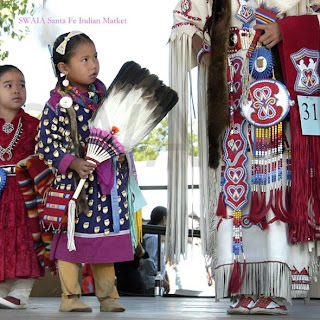 The contest includes categories for traditional and contemporary Native American fashions, features children and adult participants, and awards prizes in over 20 categories. Free and open to the public. Details: The official event continues on day two! Free and open to the public.